On one of the last warm days of the year, Nate and I wade the muddy banks of one of the largest Lake Erie steelhead tributaries. Shale crumbles down from tall cliffs, falls into brown water stained from leaf tannins. More leaves float in a slow gyre down the main channel – all the sycamore trees dropped already, the oaks and maples still hanging on. I hate that there’s no current anywhere. “The fish hate it too,” Nate says. But not really. We watch rolling steelhead, churning a slow dogleg shaped pool. In fact, they seem to prefer these slack holes where they can find a little depth. In the factory behind me, guys are running around on forklifts. I see hardhats and imagine that I’m inside some election season political ad. Despite this being the pivotal swing state – it’s mostly indicator fishing here. Nate casts a two-prince nymph rig with a big switch rod. I ask, why the big guns? Why not a single hander? 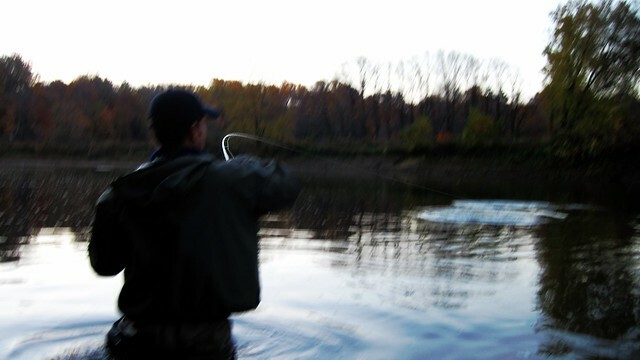 He says it helps him set the hook… and I watch him spool out a hundred feet or so of line, moving interminably slow downriver, feeding the drift into his backing. Plunk goes the bobbicator. 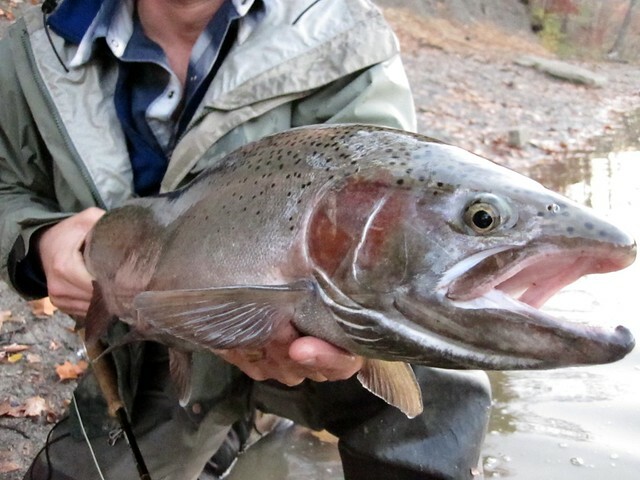 He sets the hook across miles of plastic fly line and hooks a big feisty Ohio steelhead. Nate said the fish bit when he twitched his nymphs. Also weird. The water seems a lot cloudier than the West Coast, but you have to rig much smaller diameter lines than I’m used to fishing (5lb fluorocarbon leaders?). After spending the last six years in Oregon, getting my head around how these fish think and react in their native environments – this is absolutely infuriating. I expected it to be easier. Comparable. It’s neither of those things. Is it pleasant or enjoyable? Sure, like walking a dog in the park is a pretty good time. I’m just not sure Ohio steelhead fishing is something I’m willing to risk a job or marriage over. I don’t dream at night about slowly creeping a goddamn prince nymph a long a shale bottom slack river channel, hoping a big hatchery fish will come vacuum it up. Or sitting on the couch playing back in my mind, drives down Highway 101 where green water poured through every little gap in the forest into the Pacific, squiggly blue lines on a map with big silver shapes sliding in on every tide. Yeah, that could be bad for my mental health. So I’ll get back out there. Maybe learn to like it enough to get myself fired over it. Lol! “Don’t bite your friends” Matt! Dj Lance don’t fish. Take a trip up to NY, much better current and fishing. This is fantastic, really well done. My laughter piqued my wife’s curiosity but her response to the best lines revealed that it’s not for general consumption, although the squirrel hunting line got a chuckle. Good enough, more for me to enjoy. Thanks. Try the Rocky River on the west side of the Cleveland area. It flows through a metropolitan park. The setting includes a golf course, bridle paths, etc. Deer and racoons frequent the banks. The fish are the same size, but the habitat is much more rural.